Exmark Laser Z mowers are line of riding lawn mowers. Depending on the submodel and on the deck, deflector and roll bar configurations, it can be as large as 85.8 inches wide, 96.4 inches long, 71.9 inches tall and weigh up to 1,495 lbs. A power takeoff switch, or PTO switch, connects and disconnects the blades from engine power. For safety, it can only operate when the operator is in the seat. Should any issues arise with the mower, before calling Exmark for service there are a few troubleshooting steps you can try first. Ensure the PTO is disengaged if the starter won't crank. Other actions to take include setting the parking brake; ensuring the drive levers are in neutral; charging the battery; checking electrical connections and replacing a blown starter fuse. If the relay or switch is simply defective, then contact an authorized service dealer. Make sure the fuel tank is full if the engine won't start, starts hard or won't stay running. Further solutions include opening the fuel shutoff valve; adding oil to the crankcase; and positioning the throttle midway between "SLOW" and "FAST." The choke must also be in "ON" for a cold engine and "OFF" for a hot engine. Also try replacing the fuel filter, cleaning the air cleaner element, cleaning the spark plug and ensuring that the spark plug wires are connected. Slow down if the engine loses power due to excessive load. Other areas to check are a dirty air cleaner; low oil in the crankcase; obstructions in the cooling fins and air passages; a plugged vent hole in the fuel cap and a dirty fuel filter. If there's dirt, water or stale fuel in the fuel system, contact an authorized service dealer. Slow down also if the engine is overheating from excessive load. Also check the oil level as well as the cooling fins and air passages for obstructions that may be preventing proper air cooling. 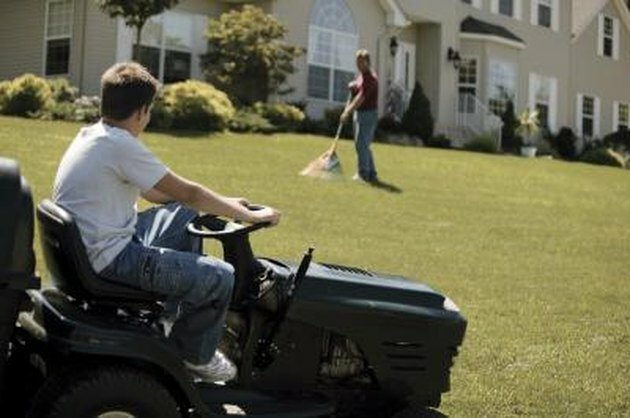 Adjust the tracking if the mower pulls left or right with both levers fully forward. Also ensure tire pressure is correct in all tires. You may have to adjust the reverse indicator and motion control linkage if the first two methods don't fix the problem. Tighten down the bypass valve if the mower won't drive. Also check, and replace if need be, the drive or pump belt for wear, looseness or falling off the pulley. A broken or missing idler spring can also be the culprit and warrant replacement. Lastly, check the hydraulic fluid for proper level and let it cool down if it's been running hot for awhile. Sharpening the blades is the first step if cutting height is uneven. You may need new cutting blades if yours are bent. Ensure the mower is level side-to-side and front-to-back. Dirt under the mower or low, uneven tire pressure can also cause uneven cutting. Install a new cutting blade if a bent or unbalanced blade is the culprit for abnormal vibration. Other possible causes of the vibration include loose blade or engine mounting bolts or possibly loose engine, idler or blade pulleys. If the engine pulley or blade spindle is damaged, contact an authorized service dealer. Check the drive belt for being worn, loose or broken if the blades don't rotate. Ensure the drive belt also isn't just off the pulley. The same instructions apply to the deck belt. Lastly, replace a broken or missing idler spring to get the blades rotating again.